MARCH TOUR ACROSS CANADA - Vancouver Island to Montreal! 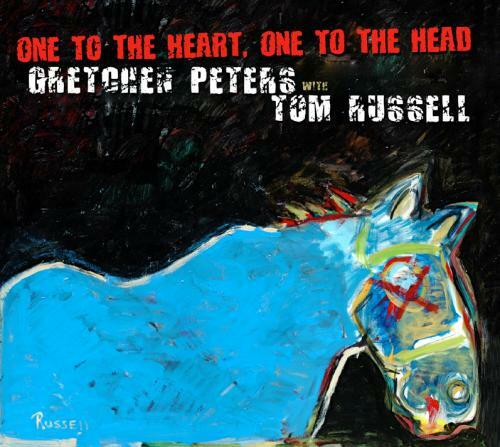 THE Tom Russell COVER ART for one to the heart (the blue horse)... is available from Rainbow Man in Santa Fe along with paintings "Snowin on Raton," and "Red Indio #1." Check them on the site below. Rainbow Man is a wonderful store which features a magnificent collection of Southwest folk art and fine crafts: from Indian trade blankets to the world's finest collection of Edward Curtis photographs. Bob, the owner, "wrote the book" on trade blankets and knows the Native American West like no other. Contact him - especially you folks in Europe with an Interest in the Native West. Bob is the Man. Tom is planning an art opening and concert at Rainbow Man (with Paul Zarzyski on the show) August 20. A good reason to visit Santa Fe. Tom Russell's Bob Dylan print: "My Love She's Like Some Raven, At My Window with a Broken Wing" (Love Minus Zero/No Limit) is now available in limited quantities from www.yarddog.com under Tom Russell in the artist section. Also, the new paintings: "Hamburger" and "Milk Shakes." Undiluted Americana in it's most colorful form. Raw vision. Yard Dog now has galleries in Austin and Marfa. Original art is almost as safe an investment than the Swiss franc. You heard it first here. Tom has been recording a new record at Wave Lab studios in Tucson with players from "Calexico" and also Bob Dylan's drummer from Unplugged. Gretchen Peters and Barry Walsh also play a strong part in backing vocal and keyboards. The album will include 12 new Russell originals; the scheduled release date in the U.S. on Shout Factory! Records is September 22. Rumor has it there might be a short Gretchen Peters -Tom Russell tour coming later in the summer for Europe...but for now it's a rumor.